One of the nicest things about having a garden is the frequency with which we encounter unearned and undeserved beauty. These experiences that jmust seem to happen, that are given to us for no reason we can ascertain, I call "grace notes". Among the many definitions of grace , the one that holds the most meaning for me is "unmerited divine assistance" or, even better, the quality of the divine breaking into one's life unexpectedly. 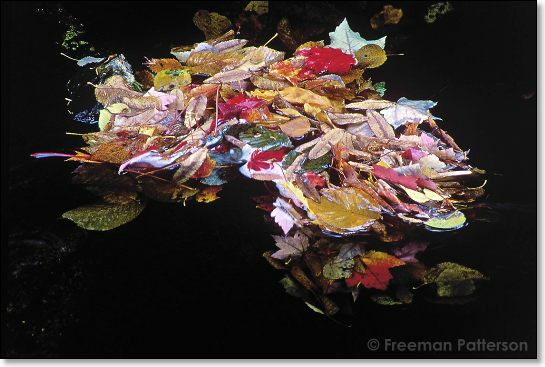 This little clump of colourful autumn leaves that formed in a pond, seems far too insignificant to qualify for divine status, too ordinary for most people to notice, yet it was an experience of grace for me. It's true that I arranged to have a stream altered slightly to create a pond, but that's all I did. I didn't plant the trees, I didn't arrange for the wind to blow the leaves off, and I didn't cause the movement in the water that brought the leaves here. The beauty just happened. For that I am very grateful.